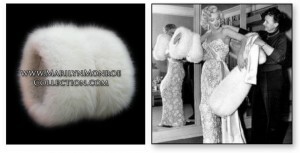 Marilyn’s furs in this collection represent the glamorous star of the silver screen. When it came to the premiere, the grand party or the big event, Marilyn had a sure sense of her own image, and dressed as she believed a film star should. This meant long white kid gloves, waterfall earrings of rhinestone and pearls, and the ultimate allure of luxurious fur. Highlights in this collection include her favorite mink collar, and a white fox muff that was the first fur she ever owned. All items come directly from the Marilyn Monroe estate. Click on a link below for additional details.